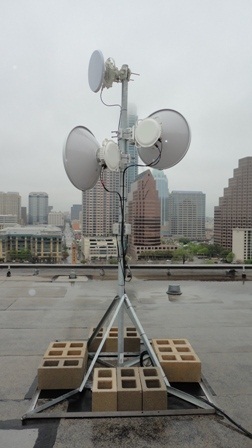 Alpha Omega Wireless is providing carrier grade wireless backhaul at the 2012 SXSW event in Austin Texas. This backhaul is allowing SXSW to provide much needed bandwidth and internet gateway access to its major venues. For this solution Alpha Omega Wireless (“AO Wireless”) is utilizing the FCC's unlicensed wireless 24GHz frequency band for point to point wireless Ethernet bridge solutions. AO Wireless has chosen to use the SAF CFIP Lumina radio platform by SAF Tehnika, an Eastern European manufacture of point to point licensed microwave wireless radio systems. President Joe Wargo says, "The 24GHz wireless spectrum band is an unlicensed frequency that is heavily underutilized in the United States. Like licensed microwave, a point to point wireless Ethernet bridge in the 24GHz unlicensed wireless band provides carrier grade wireless backhaul. The 24GHz wireless backhaul is ideal for point to point wireless bridges up to 2+ miles. With the SAF Tehnika CFIP Lumnia we can provide carrier / enterprise grade connectivity up to 366Mbps Full Duplex (732Mbps aggregate throughput) in areas where there is a lot of wireless interference. SAF provides the best in breed quality radio systems. When dealing with such a mission critical network we trust only the best microwave radio products available. Alpha Omega Wireless, Inc. ("AO Wireless") is a leading integrator of complete end-to-end wireless backhaul networking technology and solutions. Alpha Omega Wireless provides wireless site surveys, feasibility studies, engineering, spectrum analysis, path calculations, design, wireless installation, equipment sales, radio repair and maintenance, support, troubleshooting, and ongoing management & monitoring of point to point wireless links, point to multipoint wireless systems, WiMax backhaul, and wireless mesh. As well as SCADA telemetry radio, wireless video surveillance, and indoor RF. Alpha Omega Wireless works with unlicensed wireless Ethernet bridges and licensed microwave links. SAF Tehnika is the leading manufacturer of telecommunications and data transmission equipment, recognized for its role in delivering telecommunications infrastructure in 97 countries worldwide. SAF Tehnika products provide wireless backhaul solutions for digital voice and data transmission to mobile and fixed network operators, data service providers, governments and private companies. The company provides an important part of the telecommunications infrastructure to customers in 97 countries worldwide.SAF Tehnika has grown to be an acknowledged member of the industry. The company's determined focus, strong technology resources and quality products allow it to compete successfully in its market segment with the largest integrated vendors - Ericsson, Nokia Siemens Networks and NEC. Alpha Omega Wireless, Inc. will be exhibiting at the 2012 SXSW Interactive Festival. President Joe Wargo says, "We are extremely excited to be able to participate in one of the most exciting events in the world. SXSW brings together music, video, and emerging technologies all in one place. The one thing all entertainment and media have in common is the need for greater bandwidth. Wireless technologies play a key role in the creation and distribution of both music and video. People now demand the ability to get a rich media experience one their PC's, tablets, and smart phones. We are seeing an explosion of how content is delivered. Wireless broadband and wireless backhaul growth is being demanded. As a wireless integrator, we are proud to demonstrate at the event what technologies are being used to help build out America's broadband network." 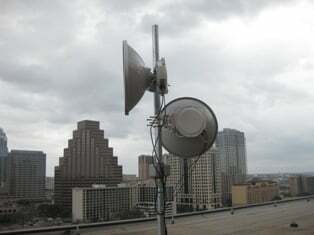 Alpha Omega Wireless, Inc., headquartered in Austin Texas, was hired for the second year in a row by SXSW to provide wireless Ethernet backhaul and outdoor Wi-Fi to multiple venues around Austin for the 26th Annual SXSW Film, Interactive, and Music Festival. President Joe Wargo says, "We were excited to be asked by SXSW to return to help them provide critical bandwidth to their major venues and some outdoor Wi-Fi at select special events. SXSW really goes out of their way to make the entire SXSW Festival an amazing event for all who attend. Over the years they have seen a huge increase in demand for internet bandwidth by its participants. Most everyone is carrying an IP enabled wireless device. SXSW just couldn't rely on the carriers to provide the bandwidth that's being demanded. We were able to deploy carrier grade, full duplex, point to point microwave links to several large venues allowing SXSW to provide bandwidth where they needed it most. For this project we used a combination of high capacity radio systems like SAF 24GHz Lumina radios and 70GHz Siklu radios. The advantage of these wireless frequency platforms was to help avoid interference. Plus they could be deployed immediately under FCC regulations. This year we also expanded multiple point to multipoint wireless backhaul to concert venues and outdoor event locations. Other major accomplishments this year was providing high speed Wi-Fi, to some high profile, outdoor party events and outdoor meeting events. For the outdoor Wi-Fi applications we used Xirrus Wi-Fi array systems in order to handle the high density of Wi-Fi users and devices. Alpha Omega Wireless, Inc. ("AO Wireless") installed a 150Mbps wireless Ethernet Bridge at SXSW that allowed NPR to broadcast world wide a live concert event at the famous Stubb's outdoor venue. The concert event featured bands like, James Blake and the legendary Duran Duran. 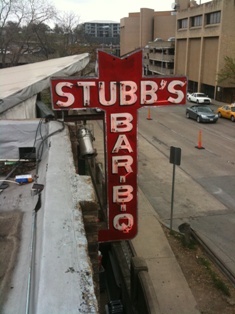 President Joe Wargo says, "We were asked just hours before the show to install a wireless backhaul from SXSW's wireless network, which we installed around Austin for the music feastival, to the famous Stubb's venue. Within hours NPR was to braodcast a live stream of the concert on the internet. Appearently, all the major carriers servicing Austin couldn't deliver even with weeks notice. We were able to install a 150Mbps point to point wireless Ethernet bridge within two hours. Everyone at the event was blown away with the speed of the install and mostly the speed of the uplink we provided. With minutes to spare the wireless backhaul link was handed off to NPR. We felt like we were a NASCAR pit crew more than a wireless integrator. It was amazing to be able to watch the live event from home later that night. The video and sound was flawless. We were proud to see the fruits of our labor and to see NPR's event turn out so great. " May 5, 2010, Sacramento, CA - Alpha Omega Wireless, Inc. (http://www.aowirleless.com) announces that it is now carrying the new SAF Tehnika' CFIP Phoenix, a TDM and IP split mount, point to point wireless backhaul radio system. The CFIP Phoenix is a licensed microwave link that also can be deployed as an unlicensed wireless bridge in the 24GHz frequency band. The CFIP Phoenix is a high capacity point to point wireless backhaul radio system that provides up to 366Mbps full duplex (720Mbps aggregate throughput) of Ethernet IP connectivity and up to 20 T1/E1 TDM channels. The spit mount wireless backhaul system includes an industrial grade fanless design that increases reliability and enables low power consumption. SAF's ACM (Adaptive Coding and Modulation) and ATPC (Automatic Transmit Power Control) provides for high availability and high density deployments. The microwave link can have up to 4093 concurrent VLAN traffic that allows building many port-to-port networks paths for specific client services. It also supports Jumbo frame size supports 9728 bytes, which allows using longer header info (VLAN, MPLS) and transmitting more useful content and less headers, thus gaining on total throughput. President Joe Wargo says, "The CFIP Phoenix allows for an easy transition from previous legacy TDM licensed microwave links. Clients can now make the switch to IP wireless backhaul while maintaining their legacy TDM traffic. The wireless bridge system can also be configured in a 1+1 to provide complete failover redundancy and can be trunked together at the IDU (Indoor Unit), which has 4 gigabit Ethernet ports, to provide double capacity. We have many clients in the government and utility space that still use TDM circuits and need IP as well. The CFIP Phoenix provide the best of both in one licensed microwave link. The SAF CFIP Phoenix allows us to perform a wireless installation of 100Mbps full duplex and can software upgrade the radios up to 360Mbps full duplex (720Mbps aggregate throughput) protecting the clients CPEX investment." April 12, 2010, Sacramento, CA - Alpha Omega Wireless, Inc. (http://www.aowirleless.com) announces its focus on utilizing the FCC's unlicensed wireless 24GHz frequency band for point to point wireless Ethernet bridge solutions. AO Wireless has chosen SAF Tehnika, an Eastern European manufacturer of point to point licensed microwave wireless radio systems, to resell and perform wireless installations in the United States. President Joe Wargo says, "The 24GHz wireless spectrum band is an unlicensed frequency that is heavily underutilized in the United States. Like licensed microwave, a point to point wireless Ethernet bridge in the 24GHz unlicensed wireless band provides carrier grade wireless backhaul.The 24GHz wireless backhaul is ideal for point to point wireless bridges up to 2+ miles. With the SAF Tehnika CFIP Lumnia we can provide up to 360Mbps Full Duplex (720Mbps aggregate throughput) in areas where there is a lot of wireless interference. The unlicensed wireless 5.8GHz band is becoming heavily saturated and it's becoming difficult to deploy wireless Ethernet bridge links in many areas. Because the 24GHz band is unlicensed we can deploy wireless backhaul links in a day with out the need to wait for a FCC license. There are many applications that need 100Mbps full duplex connectivity or greater. We also use millimeterwave 60GHz gigabit wireless radios for shorter applications, but not ever client needs gigabit wireless connections. The SAF Lumina allows us to perform a wireless installation of 100Mbps full duplex and can software upgrade the radios up to 360Mbps full duplex (720Mbps aggregate throughput) protecting the clients CAPEX investment." SAF Tehnika is a leading manufacturer of telecommunications and data transmission equipment, recognized for its role in delivering telecommunications infrastructure in 97 countries worldwide. SAF Tehnika products provide wireless backhaul solutions for digital voice and data transmission to mobile and fixed network operators, data service providers, governments and private companies. The company offers 3 product lines: the CFIP family - 108Mbps & 360Mbps Full Duplex capacity radio equipment, CFQ family - high capacity radio equipment (SDH) and CFM family - low to medium capacity radio equipment (PDH). The company provides an important part of the telecommunications infrastructure to customers worldwide. SAF Tehnika has grown to be an acknowledged member of the industry. The company's determined focus, strong technology resources and quality products allow it to compete successfully in its market segment with the largest integrated vendors - Ericsson, Nokia Siemens Networks and NEC. Alpha Omega Wireless, Inc. ("AO Wireless") is a leading integrator of complete end-to-end wireless backhaul networking technology and solutions and wireless video surveillance. Alpha Omega Wireless provides wireless site surveys, feasibility studies, engineering, spectrum analysis, path calculations, design, wireless installation, equipment sales, radio repair and maintenance, support, troubleshooting, and ongoing management & monitoring of Point to Point wireless, Point to Multipoint wireless systems, WiMax, and wireless mesh, two-way radio, SCADA (telemetry radio), wireless video surveillance, and indoor RF. Alpha Omega Wireless works with unlicensed wireless backhaul and licensed microwave wireless network connectivity.